Quality Air Heating and Air Conditioning > Articles > Heating > What Is Causing Cold Spots in My Home? What Is Causing Cold Spots in My Home? Did you know that you can run into problems when heating your home even if your heater is functioning properly? It’s an unfortunate state of affairs, but it is also one that our heating technicians can help to resolve. One of the most common complaints about underperforming heating systems is the development of cold spots in the house. If you have cold spots in your living space, dial our number. We’ll diagnose the problem, and make informed recommendations about how you can reestablish the successful heating of your home. 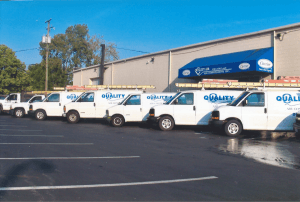 With our help, you’ll enjoy the high-quality heating in Columbus, OH that you deserve. If you use a forced air heating system, like a furnace or a heat pump, there’s a good chance that your troubles stem from compromised air ducts. All of the air that your heater heats up is delivered throughout the house via your ductwork, after all. If your air ducts are leaking or poorly sealed, then you cannot expect them to distribute heat throughout your home evenly. Another potential cause of the cold spots in your home is insufficient insulation. During the winter, the insulation in your walls, in your attic, and throughout your home serves to keep heat from transferring out into the cold environment outdoors. Remember, heat always seeks to move toward cooler areas. If you don’t have enough insulation in your home, or if the insulation is of a low R-value and is just not efficient enough, you are going to struggle to heat your home evenly. Of course, the problem may originate with your heater itself. The blower fan could be damaged, for instance, making air distribution challenging. Your heater could even be too small for your home, in which case replacing it with a more appropriately sized system will be necessary. Whatever the case may be, we can handle your heating services for you. Call Quality Air Heating and Air Conditioning with any concerns that you may have.